Remember ‘The Football Fund’? This was a financial fund set up to make loads of cash out of football and launched with a spectacular fanfare in Bangkok. In came the heavyweights of Chairman Carlos Alberto Torres (former Brazilian International and one of the highest regarded defenders of all time) and consultant; former England and Manchester United captain Bryan Robson, plus an advisory team consisting of Peter Reid, Steve McMahon, Jim Smith and Steve Darby. The idea was to put the money in football and I guess manage and manipulate clubs so their value soared at which point the investors are meant to pocket the cash and run off and buy their own Republic or Caribbean island. They also wanted to invest in footballers. As these seem to be prone to injury, real or imagined, sulks, are highly sexed, and emotionally often very immature – its not where I would want to put my cash. Former Thai Prime Minister Thaksin Shinawatra was very good at it though, just as good as he was at arranging for Manchester City players to have a good rub down in Makkasan while visiting Bangkok. Then again when he sold Manchester City at a massive profit he was apparently stiffed lending one to believe that football’s financiers are as unreliable as the players. The Football Fund spectacularly crashed in Thailand after an investigative documentary ‘How to Buy a Football Club’ produced by the same company which brought you: ‘Big Trouble in Tourist Thailand’ aired on Channel 4 Dispatches in Britain and the media world went ballistic. The programme makers managed to infiltrate the Football Fund and film the major characters involved in the scheme, mostly secretly. The only conclusion I can only come to is that it is not only people from Billericay, Essex, who leave their brains behind them when they step off the plane in Bangkok – everybody seems to – even Sven Goran Eriksson who has recently been crashing out in Bangkok. I watched the launch of the ‘Football Fund’ being played out and to be quite frank I was dumbstruck by the fawning way journalists and television producers just lapped it all up without any question. Yes. I know football is big business. Clubs are always seeking cash injections. Manchester City fans welcomed Thaksin ‘Sinatra’ with open arms. But the fact it the common garden football supporter was not going to like this. It was ripe for investigation. This is how ‘Football Speak’ put it. Fans of England and particular Manchester United were in shock as their former idol and ‘Captain Marvel’ advised buyers how to breach footballs rules. These words left viewers dismayed at how one of the iconic figures of our English game could state it is just a business. This applies with the whole football fund strategy which targets Championship clubs, getting them into the Premier League, reaping the profits and making a quick exit. The intermediaries fronted by Andrew Leppard, Robson and lawyer Steve Burkill offered many Football League clubs to purchase and when questioned by reporters if they could invest in Cardiff and Leicester City (thus breaching rules) Robson answered “Yes, it’s just how you name it because you’re only allowed to own one club.” Interestingly on their enterprise website they continuously state their goals and objectives to develop Football Clubs (notice the plural). “The Fund identifies English Championship Clubs to obtain promotion to the Premiership.” Robson advised the ‘buyer’ that Sheffield Wednesday was a good prospect. He insisted that it would be no issue getting players to join them on loan from the Premier League as he could call on his friends in the game to help. The names he mentioned included Alex McLeish, Roy Keane, Mark Hughes, Harry Redknapp Steve Bruce and Kenny Dalglish. 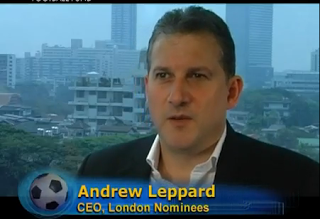 The brainchild behind the scheme Andrew Leppard, described above as an intermediary, formed the financial services company Barclay Spencer operating out of Bangkok before creating a company called London Nominees based in the British Virgin Islands to handle the ‘Football Fund’. Makes sense to me. Why put cash into someone else’s fund when you have your own? “The comments will come as an insult to millions of fans around the country paying out thousands of pounds each year to follow their sides. “The effect on the clubs could be disastrous as they may face financial uncertainty and poor results as rich business ‘toy’ with the fans’ beloved teams”, said the Daily Mail. 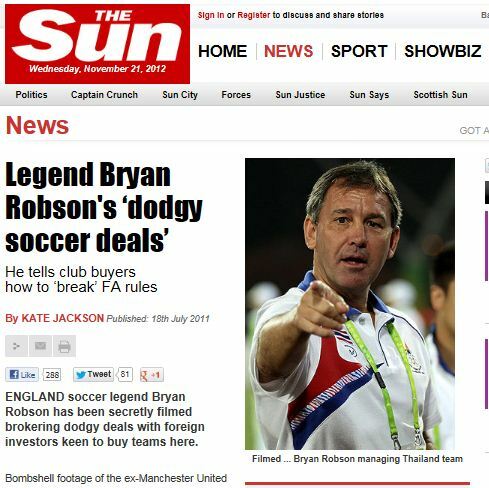 The Sun led on ‘Bryan Robson’s ‘dodgy deals’. ‘We need to stay anonymous. We need to stay off the radar as much as we can and buy the clubs,’ when he had just come out of a meeting with Robson discussing illegally buying two clubs. To cut a long story short that was the end of the Football Fund. Crucified by ‘sensationalist journalism’ said Andrew Leppard this week when I caught up with him running a laundry and dry cleaning business with his Thai girlfriend in Pattaya. “I have lost a six figure sum, reputation, and I have quit the financial business, “said Andrew. “We had a very strong team but after that programme they started pulling out as did local support. Bryan Robson (a world ambassador for Manchester United) was ordered by his club to withdraw. “With no longer a strong line-up we had no choice”. All that’s left of London Nominees was an internet page ‘under construction’ which will not be constructed, a show tape and some bad newspaper clippings. Andrew Leppard sees hope in suing Channel 4 television. He has taken legal advice in Britain, he says, and the prospective looks positive. He sees himself an an entrepreneur rather than financial advisor. Meanwhile he remains in Pattaya laundering. Channel 4 seem unconcerned. ‘How to Buy a Football Club’ was runner up in the 2011 Royal Television Society Awards in the U.K in the Çurrent Affairs’ category. However London Nominees lawyer Steve Burkill seems to be claiming some credit for an achievement in the blurb for the Bangkok legal firm Watson, Farley and Simmons. There is nothing like prematurely turning defeat into victory and the following could be termed a ‘cutting edge Bangkok resume’. 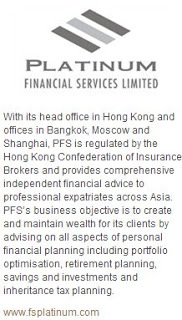 Now that sort of leads me to Thailand’s famous financial advisors of which Andrew Leppard was once a king. Below is the email from a senior executive of his old company Barclay Spencer, which begat Barclay Carrigan, which begat Barclay Spencer International, which begat PFS (Platinum Financial Services) all working out of Pacific Place in Sukhumvit – as did London Nominees – to a complaining client who had invested US$190,000 and come away with less than US$130,000. “It probably won’t surprise you to learn that you are not a very popular man in Bangkok but you have nothing to fear as I’ve managed to convince everybody that you are, quite literally, nothing and not worth bothering with. “My personal opinion is that you suffer from a very well know disease called ‘smallmanitus’. This is a very serious condition that most ‘men’ under the height of 5’ 6” catch at some time in their life. Certain sufferers confess that ‘smallmanitus’ was brought on by an unhappy event whereas others admit it is brought on by success or a happy event. “An example of a bad event might be that the ‘small man’s’ wife has recently left him for another man whereas an example of a good event might be that the ‘small man’ has recently won a court case and so is feeling 6 foot tall. If I had received an email like that after losing a total of US$60,000 on ‘low risk’ funds, I’d guess I’d be scaling Pacific Place with a commando knife between my teeth and bazooka and a couple of IEDs strapped to my back. The worst investment was when Barclay Spencer had put the client’s money into their CTA Fund (Commodity Trading Advisor) which suffered a 24 % fall from November to December 2008- then fell by a further 15% from February to March 2009- a total fall of 36.5% from its peak value for the client of 46,511.38 (Nov 08) it crashed to 29,549.15 (March 09). The CTA Fund was a London Nominees fund – run by Andrew Leppard, founder of Barclay Spencer, and still a shareholder in the Bangkok operation – a staggering conflict of interest. The client had already pointed this out in an email. “Needless to say, I am concerned at the rationale for proposing an investment in a brand new hedge fund with no track record, and which could not be tracked or verified by the main independent offshore fund trackers (e.g. FT.com, Lipper, etc). Had I been told these facts in advance I would of course have firmly and immediately refused. My most serious concern as I mentioned is Andrew Leppard’s connections with both companies, raising an undeniable conflict of interest. My research so far shows that I am not alone in being steered by Barclay Spencer towards these two London Nominee funds, and the subsequent experience and sentiments expressed by other investors have been much the same as my own”. “In the turbulent investment prevailing in the wake of the sub-prime crisis, it seems incredible that any rational investment adviser would wish to expose his client to such an investment, in the presence of thousands of other, safer and verifiable alternatives”. Well I’m afraid its tough cookie to that client and it could be tough cookie to all who invest through financial advisers in Bangkok and Thailand…unless – read on later. But that’s a strange letter from one of the top bosses of ‘an international company’. But nobody in this business says ‘We screwed up’ – and they earn money whether you win or lose. That’s of course just one example, and Barclay Spencer International or PFS, or whatever, will no doubt claim many successes. The thing is both Barclay Spencer – PFS and the biggest of all DeVere’s have two strands of worker – the haves or have nots. The haves are loaded and driving about in big cars. The have-nots hang out in cheap snooker bars in Bangkok because they are on commission only and still awaiting the expected earning ‘in excess of £100,000 a year’. Many of them are about as qualified as ‘boiler room boys’ but they don’t get a Jacuzzi with three prostitutes if they ‘close a deal’. The only difference is that boiler rooms sell you shares on non-existent or not operating companies, if you lose money with a financial advisor, it will be for investing in the wrong but genuine fund. A friend of mine was in a Bangkok snooker bar recently and he met a few DeVere guys and challenged them to a 1000 baht ( £20) stake. Nobody took it up. They said they had no money. But maybe they thought it was not a good investment. 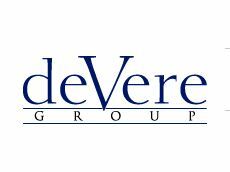 Now google the DeVere Group, google DeVere and Wikipedia – see what I mean. You have to go through pages and pages of stuff they have paid to put there themselves. These guys are not so much international financial advisors but direct sales people, selling front and back loaded funds. DeVere have spent a lot of time flooding the internet with their own promos and planted and paid for PR stuff. That should tell you to stay away. Of course it’s on a consumer complaints site. If it wasn’t you’d never see it. There are plenty more letters like that. So where do foreigners turn to for financial advice, ah, perhaps the newspapers. No not in Thailand you do not. Take the Bangkok Post. Every week it publishes and financial, legal advice column. Andrew Leppard used to write it. Now it’s written by a chap called Andrew Wood. It’s all harmless stuff. I have no particular financial training but I could write it easy enough, with a little assistance from a friend and very basic research. 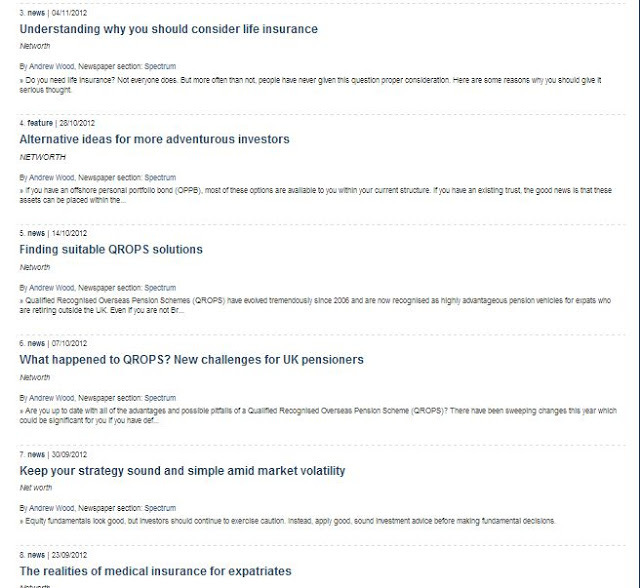 These are the recent topics he has written about. Wood does not get paid for his article. He gets a free plug every week. He probably takes the sub-editor out to dinner a couple of times a year too. I do not think any editing is required. But there he has the stamp of approval of Thailand’s premier English language newspaper basically for free – and you will see similar columns in English language newspapers in the provinces too. Despite one’s view of the British press this would not be allowed on any respectable paper in the UK. The advice may be good. But the trade off is seriously ethicallly questionable. The client quoted above read the Bangkok Post. PFS/Barclay Spencer, has interests in all the subjects Wood writes about. I have nothing against Andrew Wood or his advice. Seize the day! If a newspaper is willing to do this….But had they checked his background as a financial advisor they would not have found any. 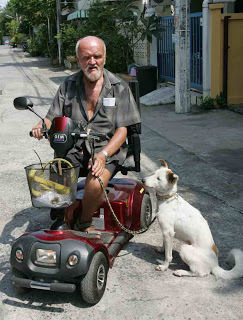 These guys turn up on English language newspapers throughout Thailand – well not so much newspapers but vehicles for their owners. The Pattaya People reserves space for advisors from DeVere’s!! But there of course is one person who is the absolute champion in this respect. He has a US$72,000 judgment out against him in the United States for share fraud. Yes you’ve guessed it. Stand up Drew Walter Noyes, writer of the ‘Ask Drew Noyes’ column in the Pattaya Times – ‘partner paper’ to the Bangkok Post. Long term readers will remember Joe McCluskey. He is the 74-year-old pensioner with Alzheimers from Ayr, Scotland, who was sent into a panic attack by an article by Drew Noyes in the Pattaya Times. Noyes had written that there was going to be a massive clampdown on foreigners in Pattaya who owned houses in company names. 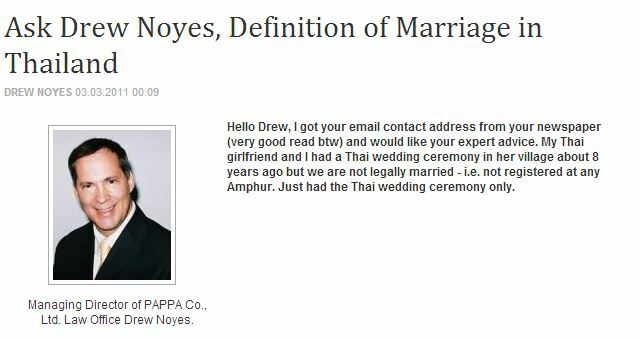 He says he went to Drew Noyes for help and Noyes promised to take care of all his problems – first Joe should transfer the 3 bedroom house in ‘The Village’, Pattaya into Drew Noyes’company name. He would buy it for 200,000 baht. But Joe need not worry. Drew would let him live in it until he died! Finally of course there ARE good financial advisors out there so here’s a tip. I picked it up from Drew Noyes. 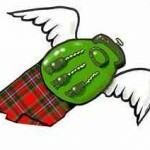 Get to know the financial advisor – everything about his private life – every little peccadillo. Then threaten to publish it when you’re back is against the wall if he does not cough up. But seriously I have a financial advisor. I have known him for the best part if 18 years. He also does my health insurance. He advertises here – Global. I must be his poorest customer but he appears to have kept my head above the water. I got my eye on the overcrowed grim-towers on Sukhumvit as a sound investment.. I'm gonna lend some chap a few million baht to make a condotel… They turned alcatraz into a hotel didn't they? And people still go to Chernobyl.. So maybe this Condotel will kick off too. 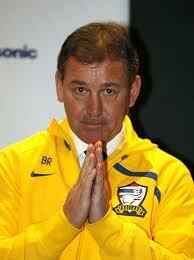 I met Bryan Robson at a Football forum a couple of years ago, when he was still Thailand manager. He came across as a nice guy with lots of knowledge about football, but not a lot about anything else. Peter Reid seems to be a similar sort of guy. Both have failed miserably in their managerial careers, so why would anyone take their financial advice? The result of his cutting edge work? 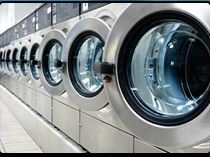 His client now runs a laundry in Pattaya. A double failure is not what I would call stellar work and the other case they seek recognition for seems to have had no outcome in the four years since they took it on. It appears turning up and billing, as opposed to winning, are the measures of success. So what happened to the Football Fund and London Nominee funds? Did they just die and take all of the investors' money with them? Thanks for that Michael – as he was on the team why did he not sue himself. I have included this now on the main report. I've also been sold into rubbish investments with DeVere. Are there any reputable investment companies out there for Expats? Looks like Mr. Leppard's new title is "Lecturer – Expatriate Professional Investment Club, BNI Member & Network Education Coordinator "